Clematis 'Mikelite' is an Estonian cultivar from the Viticella Group. It is best planted in full sun and requires pruning for the best display (pruning group 3). 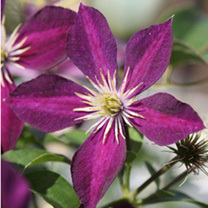 With light green foliage and plum purple-red flowers it is best planted against a dark background. Flowers from July to Spetember. Can be planted in pots and containers or even training up a trellis. Supplied in a 3-4 litre pot.